PORTLAND -- Spring spills to aid fish passage are underway at dams on the Lower Snake and Columbia rivers. 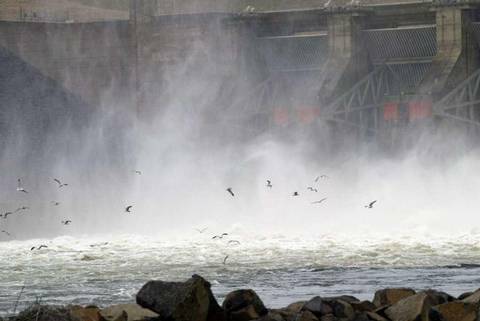 The spills began Wednesday at the four Lower Snake River dams and will begin April 10 at the four dams on the Lower Columbia River. The spills and salmon transport operations are part of the U.S. Army Corps of Engineers 2019 Fish Operations Plan for the spring and summer juvenile fish passage seasons at the facilities. In a release, Corps officials said spills this year will look different from previous years. This is due to implementation of 24-hour flexible spill operations to support downstream juvenile fish passage while also providing operational flexibility that allows federal power system benefits. "This year's operation allows us to take advantage of the off-peak, lower power demand hours to provide 16 hours of spill for juvenile fish passage, while reducing spill for up to eight hours during periods of greater power demand," said Tim Dykstra, senior fish program manager for the Corps' Northwestern Division. Dykstra added that the Corps, the Bonneville Power Administration, the Bureau of Reclamation, the states of Oregon and Washington and the Nez Percé Tribe reached a collaborative agreement to implement this new flexible spring spill operation.